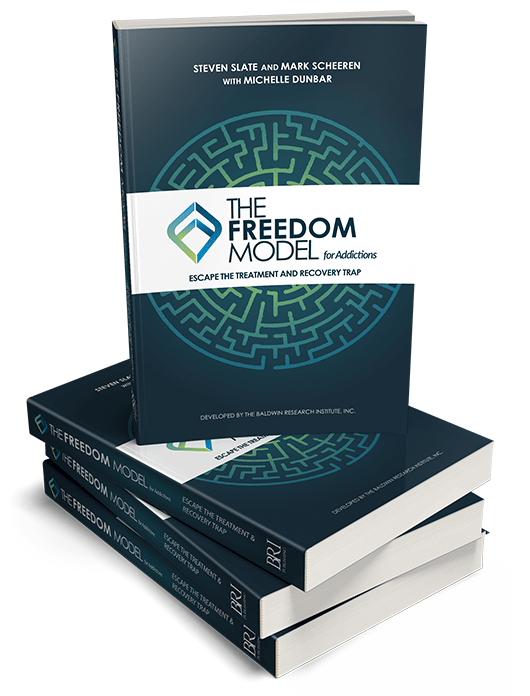 The Freedom Model for Addictions contains crucial information that you won’t find anywhere else. As a counter-treatment model, The Freedom Model for Addictions dispels the myths that are promoted by the treatment industry and the various 12 step cults that exist worldwide. The reader is freed from recovery-centered misinformation that keep individuals needlessly cycling between addiction and recovery and back to addiction again. Please Note: When discussing whether or not a program is effective, it’s important to understand that saying a program or treatment “is effective” means that it has the power to change you from the outside and will do so regardless of whether you want to change or not. This, of course, is impossible. However, when seeking a treatment program for a loved one, many family members and close friends are looking for something that will do exactly that – change the substance user even if that is not what the substance user truly wants. It’s vital to know that there is not a program, treatment, medication, or method that has the power to change what’s in a person’s heart and mind. People can and do change only when they make a decision to change internally; and they can do this only when they re-evaluate their behaviors and preferences based on factual information which is currently lacking in our treatment and recovery culture. And that is exactly what The Freedom Model provides – the facts – so the reader/s can make the changes they themselves want to make. The goal of The Freedom Model is to inform the reader with a sound, factual dissertation on how to dispel the massive misinformation regarding substance use and addiction, so they no longer need to feel hopelessly addicted, and can live beyond the shackles of “white knuckled recovery” and know true freedom. Over the past 3 decades we have witnessed thousands of people trapped in addiction, endless therapy models, treatment facilities, and perpetual recovery modes. All of this can be avoided by reading The Freedom Model for Addictions. It was written based on more than 30 years of research, and lays out what addiction actually is; which is a construct, a set of beliefs that keeps the individual trapped in their destructive habits. If you take the time to learn what defines the beliefs behind the addiction and recovery traps, it becomes very easy to recognize the path to freedom laid out for you in the course materials. We lay out the fact that addiction is not a brain disease (or any disease at all). We show you that you are able to move forward knowing there is nothing from which to “recover”. That is an example of how dramatically life transforming this information can be. You can reject a myth, (the disease concept in this case), and the secondary benefits become obvious – the power to choose is brought back to you. This is a massive shift in power from external forces such as treatment and support groups that are used to battle the disease of addiction, to you being able to choose for yourself and by yourself to what degree you still prefer substances and want to use them moving forward (or abstain completely, but do so voluntarily and without the need to be coerced or forced in some way). By learning the facts, you are reacquainted with the reality that you are a powerful person, able to choose what’s best for you, based on your unique perspective of your own life. In addition you get to change your preferences without the recovery society’s shaming, labeling, (alcoholic and addict labels) or need for treatment. You attack the problem directly – “What benefits do I feel that I am getting from my current level of substance use? Do I still feel my preference for heavy use is my best option, or is there a happier option for me in reducing that level or quitting for good?” Now this is a simplistic example. We know for many substance users dealing with some severe problems the path out might require an in depth look at all the research, case studies, and information provided in The Freedom Model on that particular angle of their struggle. The good news is it’s ALL there. Decades of research, more than 30 years of hands-on work with people struggling with complex substance use issues, and a comprehensive understanding of the recovery society myths about addiction and the need for recovery are all covered in this treatise. There is not a single aspect of addiction not addressed and clarified for the reader to make an informed decision on what and how to change their lives for the better. You can be free!